In 1961, Fairbanks-Barbosa was the first to report an infratemporal fossa (ITF) approach, indicated for advanced tumors of the maxillary sinus. Transtemporal approaches described by Fisch, preauricular approaches described by Schramm and Sekhar, and transmaxillary approaches described by Terz, Janecka, and Cocke validated the efficacy of and indications for this technique, and provided the framework for other modifications. [2, 3, 4] Recently, transnasal endoscopic and endoscopic-assisted approaches have been added to the armamentarium of skull base surgeons. See the image below. 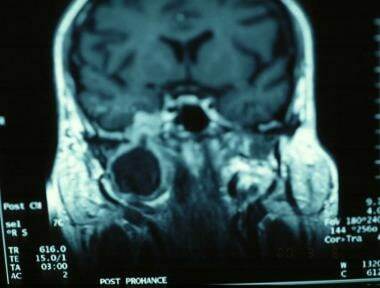 Coronal view MRI depicting a V3 neurilemoma. Any of the structures contained within or surrounding the ITF may give origin to a tumor. Although rare, the ITF may also be affected by metastasis. Evaluation of patients with ITF tumors requires the identification of their nature, origin, and extent. These factors, as well as the biologic behavior of the tumor, the patient's needs and demands, comorbidities, and the training and experience of the surgeon influence the selection of the surgical approach. A multidisciplinary team is critical to ensure an adequate diagnosis, staging, tumor extirpation, and reconstruction of consequent cosmetic and functional deficits. Patients with ITF tumors can present with various symptoms depending on the structures affected. Mass effects, eustachian tube dysfunction, trismus, and cranial neuropathies are common. Physical examination is inadequate to evaluate the ITF; therefore, imaging is the keystone of the clinical evaluation. An infratemporal fossa approach is a complex procedure that involves significant time, effort, and cost; therefore, under most circumstances, one must consider the procedure only as part of a curative therapeutic plan. Endoscopic approaches are more appropriate than conventional approaches if the goal is palliation. However, in select patients, a transnasal endoscopic approach may be used as the sole approach, yielding a complete resection that is equivalent to that of a conventional approach. Note that the indications for an endoscopic approach are in a state of rapid flux. Technology, new instrumentation, and experience drive the design and advancement of these and other minimally invasive techniques. Thus, some of these factors determine the selection of a conventional versus an endoscopic approach. Indications for a preauricular approach include tumors that originate in the ITF and intracranial tumors that originate at the anterior aspect of the temporal bone or greater wing of the sphenoid bone and that extend into the ITF. A preauricular approach may also be combined with other approaches to expose tumors that extend posteriorly or anteriorly. However, the preauricular approach provides inadequate exposure for the resection of tumors that invade the tympanic bone and does not provide adequate access to the intratemporal facial nerve or jugular bulb. The postauricular approach is designed to expose and resect lesions that involve the temporal bone and that extend into the ITF. The transfacial approach is best used to resect sinonasal tumors that require maxillectomy and that invade the ITF, the masticator space, or the pterygomaxillary fossa and for tumors of the nasopharynx extending into the ITF. However, the authors reserve its use for cancers of the antrum that extend into the ITF. The techniques for endoscopic approaches to the ITF are in rapid evolution, spearheaded by the emergence of technology geared to this type of surgery. Indications for these approaches are likewise in a state of flux, parallel to these advancements. At present, the transnasal endoscopic approaches are mostly used for benign tumors of the sinuses, nose, and throat (ie, juvenile angiofibroma), tumors that arise at the infratemporal fossa (eg, trigeminal neurilemoma) or skull base (ie, meningiomas). This approach is also indicated for select malignancies, such nasopharyngeal carcinomas that persist or recur after chemoradiation and do not involve the internal carotid artery (ICA), or as palliative debulking of cancers of the sinuses, nose, and throat, such as adenoid cystic carcinoma. The infratemporal fossa (ITF) is a potential space bounded superiorly by the temporal bone and the greater wing of the sphenoid bone; medially by the superior constrictor muscle, the pharyngobasilar fascia, and the pterygoid plates; laterally by the zygoma, mandible, parotid gland, and masseter muscle; anteriorly, by the pterygoid muscles; and posteriorly by the articular tubercle of the temporal bone, glenoid fossa, and styloid process. By this definition, the ITF comprises the contents of both the parapharyngeal space (ie, internal carotid artery [ICA], internal jugular vein [IJV], cranial nerves [CN] IV to XII) and the masticator space (ie, V3, internal maxillary artery [IMA], pterygoid venous plexus, pterygoid muscles). The ITF communicates with the middle cranial fossa via the neurovascular foramina (ie, carotid canal, jugular foramen, foramen spinosum, foramen ovale, foramen lacerum). Medially, the ITF communicates with the pterygopalatine fossa via the pterygomaxillary fissure, which is contiguous with the inferior orbital fissure and, thus, the orbit. Benign tumors usually respect these boundaries and expand the ITF in the direction of its soft-tissue planes, or they follow preexisting pathways (eg, foramen ovale, pterygomaxillary fissure). Conversely, malignant tumors can infiltrate and destroy all structures within the ITF and adjacent spaces. Neurovascular structures within the ITF (eg, ICA) or adjacent to it (eg, CN VII) limit the exposure of any particular surgical approach to the ITF. Thus, surgical approaches are designed not only to remove the tumor but also to preserve and identify these neurovascular entities. Patients in whom an ITF approach or dissection are contraindicated include those with lymphoreticular tumors, which are best treated with radiation and/or chemotherapy; patients who are poor surgical candidates due to pulmonary, cardiac, renal, or other significant co-morbidities; and patients with disseminated disease. The main limiting factor in choosing an ITF approach is extension of the tumor and its relationship to neurovascular structures. Sekhar LN, Schramm VL Jr, Jones NF. Subtemporal-preauricular infratemporal fossa approach to large lateral and posterior cranial base neoplasms. J Neurosurg. 1987 Oct. 67(4):488-99. [Medline]. Janecka IP, Sen CN, Sekhar LN, Arriaga M. Facial translocation: a new approach to the cranial base. Otolaryngol Head Neck Surg. 1990 Sep. 103(3):413-9. [Medline]. Cocke EW Jr, Robertson JH, Robertson JT, Crook JP Jr. The extended maxillotomy and subtotal maxillectomy for excision of skull base tumors. Arch Otolaryngol Head Neck Surg. 1990 Jan. 116(1):92-104. [Medline]. Poletti AM, Dubey SP, Colombo G, Cugini G. Surgical management of parapharyngeal space tumors: The role of cervical and lateral skull base approaches. Ear Nose Throat J. 2016 Dec. 95 (12):E1-E6. [Medline]. Bryant L, Goodmurphy CW, Han JK. Endoscopic and three-dimensional radiographic imaging of the pterygopalatine and infratemporal fossae: improving surgical landmarks. Ann Otol Rhinol Laryngol. 2014 Feb. 123 (2):111-6. [Medline]. Judson BL, Adam S, Lowlicht R, Bulsara KR. Transcervical Double Mandibular Osteotomy Approach to the Infratemporal Fossa. World Neurosurg. 2011 Dec 13. [Medline]. Catalano PJ, Biller HF. Extended osteoplastic maxillotomy. A versatile new procedure for wide access to the central skull base and infratemporal fossa. Arch Otolaryngol Head Neck Surg. 1993 Apr. 119(4):394-400. [Medline]. Mishra A. Transorbital approach to infratemporal fossa: novel technique. J Laryngol Otol. 2011 Jun. 125(6):638-42. [Medline]. Chan JY, Li RJ, Lim M, Hinojosa AQ, Boahene KD. Endoscopic transvestibular paramandibular exploration of the infratemporal fossa and parapharyngeal space: a minimally invasive approach to the middle cranial base. Laryngoscope. 2011 Oct. 121(10):2075-80. [Medline]. Patwa HS, Yanez-Siller JC, Gomez Galarce M, Otto BA, Prevedello DM, Carrau RL. Analysis of the far-medial transoral endoscopic approach to the infratemporal fossa. Laryngoscope. 2018 May 4. [Medline]. Fisch U. The infratemporal fossa approach for the lateral skull base. The Otolaryngologic Clinics of North America. Philadelphia, Pa: WB Saunders Co; 1984. 513-552. Terz JJ, Young HF, Lawrence W Jr. Combined craniofacial resection for locally advanced carcinoma of the head and neck II. Carcinoma of the paranasal sinuses. Am J Surg. 1980 Nov. 140(5):618-24. [Medline]. He Y, Yang H, Sun J, Zhang C, Zhu H, Liu Z. Prognostic factors in pterygopalatine and infratemporal fossa malignant tumours: A single institution experience. J Craniomaxillofac Surg. 2015 May. 43 (4):537-44. [Medline]. Prasad SC, Mimoune HA, Khardaly M, Piazza P, Russo A, Sanna M. Strategies and long-term outcomes in the surgical management of tympanojugular paragangliomas. Head Neck. 2015 Sep 7. [Medline]. Carrau RL, Prevedello DM, de Lara D, Durmus K, Ozer E. Combined transoral robotic surgery and endoscopic endonasal approach for the resection of extensive malignancies of the skull base. Head Neck. 2013 Nov. 35(11):E351-8. [Medline]. Bly RA, Su D, Hannaford B, Ferreira M Jr, Moe KS. Computer modeled multiportal approaches to the skull base. J Neurol Surg B Skull Base. 2012 Dec. 73(6):415-23. [Medline]. Fahmy CE, Carrau R, Kirsch C, Meeks D, de Lara D, Solares CA. Volumetric analysis of endoscopic and traditional surgical approaches to the infratemporal fossa. Laryngoscope. 2014 May. 124(5):1090-6. [Medline]. Kasemsiri P, Solares CA, Carrau RL, Prosser JD, Prevedello DM, Otto BA, et al. Endoscopic endonasal transpterygoid approaches: anatomical landmarks for planning the surgical corridor. Laryngoscope. 2013 Apr. 123(4):811-5. [Medline]. Axial view MRI depicting V3 neurilemoma of the infratemporal fossa. Bicoronal incision with preauricular extension. The superficial layer of the deep temporal fascia has been incised, revealing the temporal fat pad. Depiction of possible orbitozygomatic osteotomies. Skull base relationships. The lateral pterygoid plate, foramen ovale, and the foramen spinosum are depicted in a straight-line relationship from anterior to posterior. The carotid canal is posterior and medial to these structures. A temporal craniotomy and osteotomy for condylectomy and coronoidectomy. From posterior to anterior (left to right), internal carotid artery (petrous), middle meningeal artery, V3, and V2. Intraoperative photograph after a total parotidectomy, segmental mandibulectomy, and infratemporal fossa resection. Markings depicting the facial incisions for a facial translocation approach. Exposure of the maxillary and orbitozygomatic areas. Disclosure: Received consulting fee from Karl Storz Endoscopy for consulting; Received consulting fee from Stryker Instruments for consulting; Received equity stake from NICO Corporation for board membership.